When a person making anti-H3N2 IgE is infected with H3N2, one can expect the course of the flu to be significantly worse. So the “cytokine storm” being observed in severe cases is likely to be an infection concurrent with an allergic reaction. Death is caused by anaphylactic shock but due to the presence of an infection, it is wrongly classified as septic shock. In the case of food allergy for example, the allergen exposure can be large enough to cause an immediate hypersensitivity reaction and anaphylactic shock within minutes/hours. In the case of influenza allergy, it may take a day or two for the virus to replicate and produce enough viral exposure for anaphylaxis. So the anaphylaxis unfolds over a couple of days. “While the medical establishment sees the development of resistant diseases as an opportunity to develop more ineffective, but profitable, vaccines, holistic doctors know that the risk of such a tactic far outpaces any theoretical benefit. The pathogens simply continue to evolve around the medical establishment’s “big guns” — toxic vaccines. That’s why most measles outbreaks, for example, are triggered in “fully vaccinated” populations. More deaths due to the vaccine than the disease! 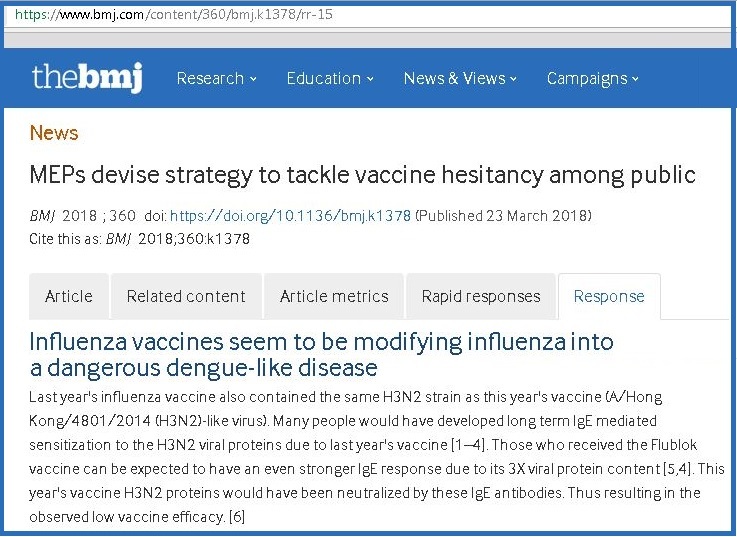 “Note the reference to ‘higher viral shedding…’ — the vaccine creates the pandemic. This long, detailed and immensely important article makes it crystal clear where the lies and distortions are about vaccines, whether they work, whether they cause chronic illnesses and whether they are safe. Before you allow yourself or your wards, children, family, elders or others to take another vaccination, read this article. Listen to Dr. King discuss this article on the Dr. Rima Reports live (www.HealthFreedomPortal.org to join the chat and listen to the show or at www.OracleBroadcasting.com to listen to the show or in the archives at www.OracleBroadcasting.com following the broadcast on Sunday, October 3, 2010, 10 AM to 1 PM Eastern time. Dr. King knows full well that vaccines are intentionally used to create disease and profit while they do nothing to prevent disease. Listen to him, read the article below and share this article as widely as possible. paragraphs that follow this introduction. “salvation” of mankind – because such discussions belong in the realm of religion and not science. as we, and not society, sees fit for ourselves and the minors and non-competent persons in our care. individually), “vaccines are the safest of medicines” or, more simplistically, “vaccines are safe”. information, or (2) acts in deliberate ignorance or reckless disregard of the truth or falsity of the information”. manufacturers from damages that include “vaccine-related injury or death”. group or, in most instances, individually, vaccines are not the safest medicines. National Vaccine Injury Compensation Program. matter, the fiscal and physical health of the people of the United States Of America (USA). “vaccination” program was the “smallpox” inoculation program. which is still in use today. judgments against the vaccine companies. 34 and, in stages, became effective in 1987 and 1988.
dose of vaccine administered, and b) shield the vaccine makers from being easily sued. safe as possible and reduce the risk of adverse reactions. include adults in many instances. manufacturers’ fines to the rate of inflation. that has become increasingly litigious and unfair4. (see: Federal Register / Vol. 75, No. 176 / Monday, September 13, 2010 / Proposed Rules / 55503 – 55507). caused by their vaccines, had been removed. of vaccine makers and/or their subsidiaries has increased to a veritable river. underlying vaccine is not even truly effective or, in some cases, not even reasonably safe. incidence in determining that a given vaccine is “reasonably safe”. reaction in the candidate vaccine compared to that adverse reaction in the “placebo” group. intussusception was 3 times that found in the control group. shortly after its introduction in 1998, RotaTeq’s on-label use would not cause intussusception. Kawasaki’s disease were also reported6. profited, simply withdrawn from the market. formulations currently being produced in “eight” manufacturing sites. preventable” disease in their community regardless of their disease status. adjuvants used or, where possible, eliminating the use of adjuvants altogether. long-term safety for use in human vaccines has not been proven individually much less collectively. Monit. 2008 Mar; 14(3): PH9-PH16. which every covered biological drug product must meet. health of their children because complying is for the “greater good”. exposure to injected Thimerosal (49.55% mercury by weight) in 1983.
of Thimerosal in childhood vaccines. approved influenza vaccines were Thimerosal-preserved vaccines. inoculated with a flu vaccine from contracting influenza. flu shots (a month apart) the first time they were vaccinated. age, and b) also designated pregnant women and young children as targeted “high risk” groups. under 21 U.S.C. § 351(a)(2)(B). influenza vaccine formulations to inoculate pregnant women and developing children. mercury has not dropped from the 2000 level but rather the maximum exposure level has increased. and abnormal behaviors have not dropped but rather these levels have also collectively increased. financially and physically drained trying to care for our chronically ill loved ones. shortened to be completed by 4.5 months of age and the incidence of neurodevelopmental dysfunction doubled. and Youth. JAMA 2010 February 17; 303(7): 623-630.
short-term and, more importantly, true long-term safety for any of these Establishment products. chickenpox, mumps, rubella, and tetanus). other developmental abnormalities and bowel disorders. depended on the vaccine’s being effective and the mass vaccination program’s being cost effective. vial. The commercial list price costs of the two 3-dose series are US$ 390.81 and US$ 386.25, respectively. also being infected by the “native”/“wild” strains of HVZ circulating in the USA. effectiveness in preventing cervical cancer. Establishment attributes to mere coincidence. of adverse-event reports in the VAERS database in the 1990s and early 2000s. engineered bovine-human hybridized viruses in Rotateq. by the natural disease in the control population used in the phase-3 clinical trials. Infection Among Females in the United States. JAMA. 2007 February 28; 297(8): 813-819. … Our data indicate that the burden of prevalent HPV infection among women was higher than previous estimates. trial by jury on the facts of each case. according to the rules of the common law”. related to vaccine-related injury or death for which the civil action was brought”. harm to the Bruesewitz child. wields, the people will be lucky if the US Supreme Court finds for the Bruesewitz plaintiffs. during the “flu season” – none whatsoever (see, for example, Geier DA, King PG, Geier MR. Here, “this title” is “TITLE 42 – THE PUBLIC HEALTH AND WELFARE” of the United States Code. from getting “influenza” during the “flu season”. Nutr. 2010 May; 91(5): 1255-1260. Epub 2010 Mar 10. PMID: 20219962). Among the issues this electronically published review article addresses is the absence of any valid value for the sick-to-well infectivity for human influenza in spite of numerous attempts to determine even a valid estimate, which clearly establishes that influenza is not highly infective.]). days after being inoculated with said live-virus vaccine. of suboptimal protection from getting the two (2) type A strains of flu in the flu vaccine. science nor based on public health concerns; they are clearly driven by other imperatives. saline for the controls] with > 50,000 in each arm of the study). additional multiple of that number each year to varying degrees. childhood medical conditions that once were rare (< 1 to 2 instances in every 10,000 children) but are now at epidemic levels (> 1 instance in every 10 to 1,000 children)? her own informed medical decisions without fear of any retribution, ostracism or oppression. live births or about 8,000 – 9,000 newborn babies in the USA each year. fiscal and physical health is stolen from us? any penalty, stigma, or recriminations from those who do not share the same views. differing views about vaccination and vaccination programs. revised version of this article. Will You Let Clean Food Die This Week? Health and Food Freedom’s Voice™! It’s a MUST LISTEN! Take Action now to make sure that YOUR Senators place a “HOLD” on this bill to insure that it is not passed by “Unanimous Congressional Consent”. One Senator, placing, and sustaining, a hold on the bill can force it to be delayed, despite the demands of Monsanto and their friends. HOLD it until December and it dies with the close of this Congress. This just in: we have word that a Senator from an important western State opposes the bill and may be willing to face down Big Agribiz. Take this Action Item IF there is support from other Senators. It is urgent that you take action now even if you have raised your voice on this topic before because massed protesting voices are OUR SIDE’s lobbyist! We’re going to be “gifted” with a health care plan we are forced to purchase and fined if we don’t, written by a committee whose chairman says he doesn’t understand it, passed by a Congress that hasn’t read it but exempts themselves from it, to be signed by a president who also smokes, with funding administered by a treasury chief who didn’t pay his taxes, to be overseen by a surgeon general who is obese, and financed by a country that’s broke. Stop the Slaughter: Demand Congress Investigate FDA’s Role in Autism and Other Vaccine Related Epidemics NOW! 1. Changed the ACIP (Advisory Committee on Immunization Practices, part of the CDC which is part of the Department of Health and Human Services, or HHS) Guidelines to recommend Seasonal Flu vaccination for everyone starting at 6 months and extending throughout the life span. What ACIP “recommends” generally becomes State, school and other agency mandates within a very short time. 2. Included H1N1 vaccines in the “seasonal” flu shots for 2010-2011 flu season despite a total lack of medical requirement for such inclusion (or, indeed, for any vaccination, for that matter). People avoided the seasonal flu shots at the same time they avoided the H1N1 shots in 2009-2010 leading to the lightest flu season in memory. The correlation is excruciatingly clear: flu shots create disease. Disease is good business. Therefore we must have flu shots, says the global government. 3. Ignored totally the fact that Canada, Finland and Australia have taken the GSK flu vaccine off the market in those countries because of serious side effects. Side effects include an incurable neurological condition called “narcolepsy” or uncontrollable sleeping episodes, convulsions, miscarriages and death. Of course, the FDA holds that the tremendous increase in post vaccination miscarriages, among those side effects, is not worth worrying about. 4. Conveniently found a “professional organization” to call for mandatory vaccination of health care workers at peril of losing their jobs if they are unvaccinated. The Society for Healthcare Epidemiology of America, http://www.shea-online.org/, has done just that. Among all responding HealthCare Professionals, 28% strongly favored the mandatory vaccination while 58% strongly opposed it. 36% strongly agree with the mandates while 44% strongly oppose them. For nurses, who tend to be closer to the adverse events associated with vaccination, those strongly agreeing with the need for a mandate, 26%, were strongly outnumbered by those opposing it, 59%. Only 34% of pharmacists, who sell the vaccines, strongly endorsed the mandate while 46% strongly opposed it. The US Government, including FDA, CDC and ACIP cannot, apparently, get enough vaccines into the public. The Department of Defense (DOD) is not far behind since civilians working for the DoD Schools in Europe were notified on July 30, 2010 that their Swine Flu AND Seasonal vaccination was mandatory and that failure to receive this vaccination would result in dismissal from their jobs. Likewise, about 30,000 students are now required to receive the untested and unnecessary vaccines despite the fact that WHO has publicly rescinded their failed “Level 6 Pandemic” attempt. “The immunization policy, mandated by U.S. European Command [EUCOM], covers both the seasonal and swine flu viruses and applies to teachers and employees at more than 80 Department of Defense Dependents Schools [DoDDS] in Europe, as well as 30,000 students. Children older than 6 months enrolled in base daycare centers and daycare center workers throughout Europe also are affected by the move. So we Health Freedom advocates have to ask “Who owns the body of these teachers and their students?” Apparently, the Department of Defense does. And just who owns your body? Medical Insanity Alert – Fasten Your Intellectual Seat Belt! September 7, 2010 “A 2 + 1 pneumococcal vaccine dosing schedule is linked to an increased risk of acquiring a multiresistant strain, according to the results of a study reported in the September 8 issue of the Journal of the American Medical Association. What could be crazier? The vaccine we have approved causes resistant organisms to develop and leaves people more susceptible to infection with them. YES! NOW, let’s create not a 7 organism vaccine, but a 23 organism one and watch this one screw up people’s immune systems so that not even the most potent antibiotic will work. Nano silver? Oh, let’s ban it the way we have in Europe since it IS the universal safe, effective and inexpensive antibiotic which makes all other antibiotics unnecessary. Gives the lie to vaccines, too, since with a good immune system and nano silver you loose even the pretext that they have any place in health or prevention. We recommend www.Nutronix.com/naturalsolutions as a source of our favorite nano-silver. Stockholm, Sweden, September 16, 2002. A new Swedish study has found that flu vaccine is “possibly no better than placebo in preventing exacerbations in asthmatic children.” Reporter Cameron Johnston reports that “Asthmatic children and other groups are usually encouraged to receive the flu vaccine each year as winter approaches. However, according to one study, the flu vaccine may be no better than placebo for preventing influenza-induced asthma exacerbation among children. “One of the most bizarre twists on the flu vaccine saga is the CDC recommendation of 2001 that all pregnant women receive the vaccine in their second or third trimester. This recommendation even has doctors confused, since the vaccine remains a category C drug (unknown risk for pregnancy). No adequate studies have been conducted to monitor safety of the vaccine for mother and fetus. The only studies of adverse effects in pregnancy were conducted in the 1970s (Heinonen et al., 1973; Sumaya & Gibbs, 1979). Some flu vaccines still contain mercury as a preservative, despite a 1998 FDA instruction to remove mercury from all drugs. According to the CDC, two groups are most vulnerable to methylmercury, the fetus and children ages 14 and younger. An article published in the American Journal of Epidemiology in 1999 stated, “the greatest susceptibility to methylmercury neurotoxicity occurs during late gestation” (Grandjean et al., 1999). How did CDC committee members determine that flu vaccines were safe for pregnant women? They did not. The committee, despite its own recommendation, states, “additional data are needed to confirm the safety of vaccination during pregnancy” (CDC, 2001b). Dr. Hugh Fudenberg, one of the world’s leading immunogeneticists, states the chances of getting Alzheimer’s disease is 10 times higher if an individual has five consecutive shots than if they have one, two or no shots. and on and on and on and on. Yet the government insists vaccines are safe and effective just as if there were a shred of real evidence that they are either one. This is simple madness. The craziness that is vaccination MUST stop at your body and your children’s. The choice is yours. Valley of the Moon Coffee Makes a Perfect Holiday or Corporate Gift! Thanks for being a part of the Health Freedom RE-Evolution! It’s your health, your body, your choice! And thank you for helping to keep health freedom free! Your tax deductible recurring donation is much needed and greatly appreciated! Aroma Therapy and Your Health! Dietary Supplement Mind Enhancement Packs! YES! The Marketplace is BACK!